We are engaged in offering a wide range of Buckets to our valuable clients. Our products are known for its look, colors and designs. Manufactured with galvanized iron sheets, these buckets can add natural look in the garden. These are available in different shapes and sizes at market leading rates. 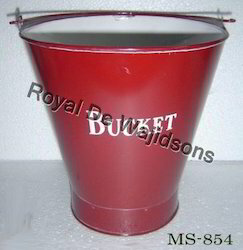 Deva International manufactures excellent quality of bucket pots. This product is highly appreciated by people who love to maintain garden. 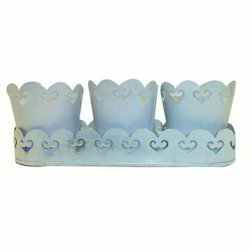 We are manufacturer & exporters of Tin votives. This bucket design tin votive aviallable in different colors. As an affluent name in this domain, we hold expertise in providing high quality Garden Flower Bucket. Backed by huge industry experience and market understanding, we are involved in providing a wide variety of Garden Flower Bucket. Size: Top Dia-6", Bottom Dia-5", H-6"
Description: Skilled craftsmen churn out a mesmerizing range of garden planters.